The heart of the campus has a number of historic buildings. 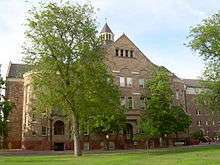 The longest-standing building is University Hall, built in the Romanesque Revival style which has served DU since 1890. The cornerstone to this building is exactly one mile above sea level. Just a few blocks off campus sits the historic Chamberlin Observatory, opened in 1894. Still a fully operational observatory, it is open to the public twice a week as well as one Saturday a month. 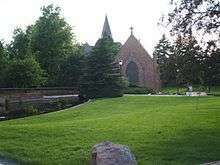 The central campus area also includes Evans Chapel, an 1870s-vintage small church which was once located in downtown Denver, and was relocated to the DU campus in the early 1960s. Buchtel Tower (1913) is all that remains of the former Buchtel Chapel, which burned in 1983. The administrative offices are located in the Mary Reed Building, a former library built in 1932 in the Collegiate Gothic style. 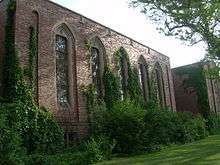 Margery Reed Hall (named for the daughter of Mary Reed) was also built in the collegiate gothic style in 1929. Margery Reed Hall has recently been designated to house the Undergraduate Program for the Daniels College of Business; an $8 million overhaul and renovation was just completed early 2014. The update for the building was to include more classroom space, a larger hall to host guest speakers, as well as mechanical and technical improvements. Under the leadership of former Chancellor Daniel Ritchie (now Chairman of the Denver Center for Performing Arts), about $500 million in capital improvements have taken place in the last decade and the learning inside these new buildings has improved in the same period, as admissions selectivity and rankings have improved dramatically. 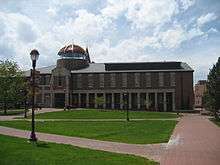 DU completed the first ever (Peter S. Barton) lacrosse-only stadium that was specifically designed for the sport in 2005, as well as new Ciber field soccer stadium (2010) on the northern end of campus. Ciber field also contains new studio space for the School of Art adjoining the main grandstand, as well as the Pat Bowlen varsity sports weight training facility underneath the stands. At the beginning of the summer of 2011, the 41-year-old Penrose Library closed for a $32 million renovation, and reopened in the Spring of 2013 as the Anderson Academic Commons, a 21st-century high tech collaboration and study space - one of the most advanced and technologically capable libraries among universities throughout the country. The university has five residence halls, Johnson McFarlane Hall (JMac), Centennial Halls, Centennial Towers, Nelson Hall and Nagel Hall. Johnson McFarlane Hall was recently energy star certified as one of the most energy efficient buildings on campus, and is the oldest co-ed dorm in the western United States. 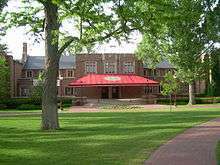 The University of Denver is ranked 86th among all public and private "National Universities" by U.S. News & World Report in the 2015-2016 rankings. The undergraduate business program, The Daniels College of Business, was ranked 57th best in 2012 by BusinessWeek, and it was ranked the 71st best program by U.S. News in a 2008 ranking. 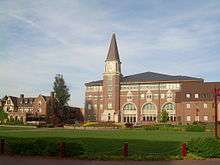 In 2011, The University of Denver's Daniels College of Business was ranked 2nd in the nation for its ethics programs among 111 undergraduate business schools by Bloomberg Businessweek. The Sturm College of Law was ranked the 64th best Graduate Law School by U.S. News & World Report in a 2013–2014 ranking, and 12th for its part-time law program. The Graduate School of Social Work is ranked 16th by U.S. News & World Report. 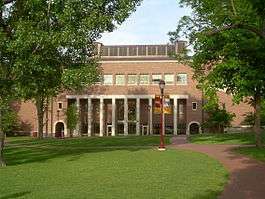 The Clinical Psychology Doctoral Program in the Department of Psychology was ranked 47th by U.S. News & Report in 2012. The School of Accountancy at Daniels College of Business has ranked #9 in the top programs by specialty by Bloomberg BusinessWeek in 2011. The Aspen Institute's 2011–2012 edition of Beyond Grey Pinstripes, a biennial survey and alternative ranking of business schools, recently ranked the Daniels College of Business the 15th best MBA program in the world. The survey puts emphasis on how well schools are preparing their students for the environmental, social, and ethical complexities of modern-day business. Recently, the University of Denver Sturm College of Law has undergone an internal renaissance. In 2003, the University of Denver Association of Trial Lawyers of America trial team won the national championship in New Orleans, taking Harvard's title from the previous year. DU's athletic teams are known as the Denver Pioneers. The school has been fielding athletic teams since 1867, winning 31 NCAA Division One titles since 1949—among the top 10 of all schools. 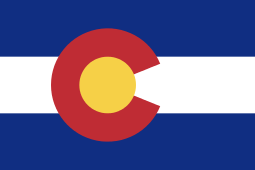 Denver is best known as a major power in winter sports, in particular, skiing and ice hockey. DU has won 23 NCAA national team skiing championships (more than any other school). Ice hockey is DU's flagship spectator sport, with seven NCAA titles (third among all schools), including back-to-back crowns in 2004 and 2005. The program has produced 75 NHL players and regularly sells out the 6,000 seat Magness Arena on campus, the showpiece of the Ritchie Center for Sports and Wellness. The Pioneers captured their first men's lacrosse championship in 2015, beating Maryland, 10-5. They are the first Division I men's team west of the Appalachians to win a men's NCAA lacrosse championship. The school has identified itself as the Pioneers since 1925. Previous mascots were Pioneer Pete (1920s to 1968), Denver Boone (1968 to 1998), and Ruckus the red-tailed hawk (1998 to 2007). A 2013 task force generated three new mascot options, but none of them carried enough votes from the University community to merit selection. ↑ Separated brethren: a review of Protestant, Anglican, Eastern Orthodox & other religions in the United States. Our Sunday Visitor. Retrieved March 27, 2010. Among Protestant denominations, Methodists take first place in hospitals and colleges. Some of their one hundred colleges and universities have all but severed ties with the denominations, but others remain definitely Methodist: Syracuse, Boston, Emory, Duke, Drew, Denver, and Southern Methodist. The church operates three hundred sixty schools and institutions overseas. Methodists established Goodwill Industries in 1907 to help handicapped persons help themselves by repairing and selling old furniture and clothes. The United Methodist Church runs seventy-two hospitals in the United States. ↑ "Schools by Jurisdiction". United Methodist Church. Retrieved December 14, 2011. ↑ As of June, 2013. "U.S. and Canadian Institutions Listed by Fiscal Year 2013 Endowment Market Value and Percentage Change in Endowment Market Value from FY 2012 to FY 2013" (PDF). 2014 NACUBO-Commonfund Study of Endowments. National Association of College and University Business Officers. January 28, 2014. Retrieved April 7, 2014. 1 2 Archived June 29, 2011, at the Wayback Machine. 1 2 3 "STUDENT PROFILES". Du.edu. Retrieved May 22, 2015. ↑ University of Denver (August 1, 2008). 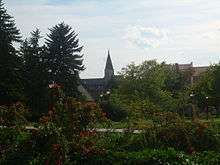 "University of Denver – The Look of Campus". Retrieved August 1, 2008. ↑ University of Denver. "Facts & Figures". du.edu. ↑ Form W-9, Request for Taxpayer Identification Number and Certification. University of Denver. Retrieved on November 26, 2016. 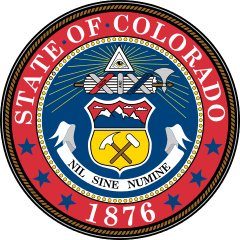 ↑ "The University of Denver's Historic Chamberlin Observatory". Denver Astronomical Society. Retrieved August 27, 2014. ↑ "Grad Profiles - University of Denver Daniels School of Business". gradprofiles.com. ↑ "2014 National Universities Rankings". Washington Monthly. n.d. Retrieved May 26, 2015. ↑ "Business Week Undergrad Business Rankings 2008". Bwnt.businessweek.com. Retrieved 2012-08-05. ↑ "Bloomberg Businessweek Undergrad Business School Rankings 2011". Businessweek.com. Retrieved 2012-08-05. ↑ Harden, Mark. "University of Denver's Daniels business college ranks 2nd in nation for ethics. Denver Business Journal". Bizjournals.com. Retrieved 2013-09-28. ↑ "Rankings & Profiles". Businessweek. Retrieved 2013-09-28. ↑ "U.S. News 2009 Law School Rankings". Grad-schools.usnews.rankingsandreviews.com. Retrieved 2012-08-05. ↑ Abramson, Seth. "2012 Creative Writing Doctoral Program Rankings: The Top Fifteen | Poets and Writers". Pw.org. Retrieved 2012-08-05. ↑ "Clinical Psychology Rankings 2012". U.S. News. Retrieved 18 July 2012. ↑ "University of Denver | Office of Institutional Research and Analysis | External Rankings". Du.edu. Retrieved 2014-08-14. ↑ Johnson, Hugh. "University of Denver ranked number one in percentage of students who study abroad". Denver Post. Denver Post. Retrieved 18 November 2015. ↑ University of Denver. "Colorado Women's College". du.edu. 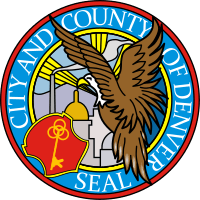 ↑ University College,University of Denver. "University of Denver University College - College of Professional and Continuing Studies". University of Denver, University College. ↑ "Gilbert E. Carmichael papers" (PDF). librarymsstate.edu. Retrieved May 5, 2014. ↑ "Study Abroad". Du.edu. Retrieved 2013-09-28. ↑ "The University of Denver Law Students Win National Mock Trial Competition in New Orleans". Justice.org. Retrieved 2013-09-28. ↑ "Explore: The Search for a DU Mascot". Du.edu. Retrieved 2013-08-21. ↑ Chiaramonte, Perry (August 20, 2013). "Daniel Boone-like mascot for Denver college deemed offensive by administration". Foxnews.com. Retrieved 2013-08-21.